The documentary “Eating Animals,” which examines the mass production of meat, is based on the 2009 book by Jonathan Safran Foer (above). Just in time for the rechristening of IHOP as IHOb — the International House of Burgers — comes Christopher Quinn’s blunt and disturbing documentary “Eating Animals,” which opens Friday. Based on the 2009 book by Jonathan Safran Foer, it shows how the mass production of meat, dairy, and eggs tortures animals, destroys the environment, endangers people. It isn’t even genuine capitalism, the film argues, but a version of Soviet centralization, with a handful of corporations operating thousands of food factories across the country. And many of those who “own” these farms don’t profit by them. Instead they must abide by draconian contracts, piling up debts, and are reduced to “low-level managers of their own property,” as Foer’s voiceover narration (read by Natalie Portman) points out. It wasn’t always this way. Until the 1970s, independent farmers, once considered the epitome of our free enterprise system, produced most of the meat and animal products for American consumers. The treatment of animals then was relatively humane. They weren’t pumped full of drugs, raised in crammed, squalid conditions, and their lives were not, as one interviewee puts it, “unmitigated misery from the moment they are born to the moment they are slaughtered.” But with the rise of fast-food chains and a demand for cheap meat, corporations took over, filling the demand by means of inhumane and environmentally toxic methods. Quinn focuses on the stories of some of those who have chosen to defy this system. A man in North Carolina noticed that the fish he was catching in a local creek had developed sores. Then they began dying. He followed the creek upstream and discovered a landscape of giant pig farms and hundreds of giant pink pools. The pools were full of animal waste leaching into the water system. That’s when he became an activist. The filmmakers accompany him as he tries to gain access to the farms to film the conditions inside. Private security guards stop him and threaten him even though he is driving on a public highway. Other whistleblowers are profiled. James Keen, a scientist at a government livestock research center, reported dubious practices at his workplace benefiting the farm industry. Changes were made, but his idealism cost him his job and his marriage. A contract chicken farmer, in debt and disgusted with the way the animals are treated, shares images of deformed, dead, and dying birds. Though 50 and with a family to support, he decides to end his contract and somehow start anew. As for solutions, except for a general call for change, “Eating Animals” comes up short. 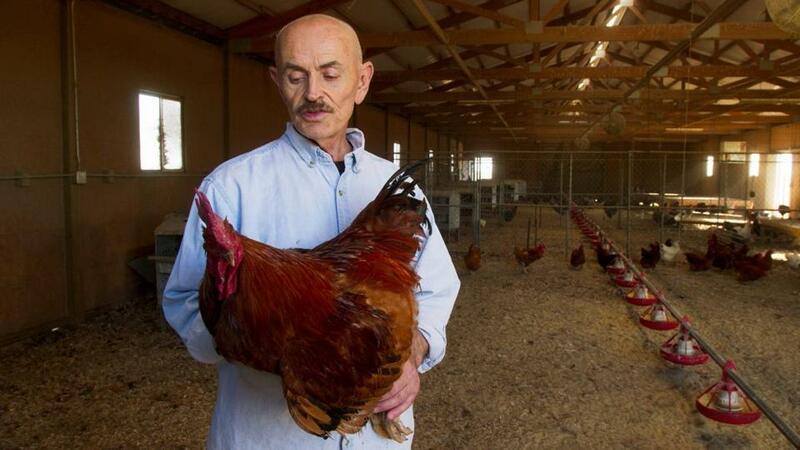 A turkey farmer sticks to traditional ways of raising birds and starts an institute to keep the practice alive. An old-fashioned free-range pig farmer boasts about how a customer — the owner of a fancy San Francisco restaurant — said that his pork was the best he had ever eaten. These do not seem practical alternative ways of feeding the masses. And good luck converting everyone into vegans. Though not as graphically powerful as other documentaries on similar subjects, such as Fredrick Wiseman’s “Meat” (1976) or Georges Franju’s “Les Sang des Bête” (1949), the emphasis on the disastrous global impact of these practices is more disturbing. You might consider watching it before ordering an IHOb Ultimate Steakburger. Directed by Christopher Quinn. Written by Quinn and Jonathan Safran Foer; based on Foer’s book. Narrated by Natalie Portman. At Kendall Square. 94 minutes. Unrated (distressing images of abused animals).